MIDDLEBURY, Ind.--(March 2008)-- Pilgrim International, Inc. is pleased to announce the launch of its completely redesigned interactive website at www.pilgrimintl.com. The site now includes a fresh new look and format, as well as a unique interactive interior décor selection feature that allows consumers and dealers to view fabric, décor and wood options with a click of the mouse. The new site features the full line of Pilgrim International travel trailers and fifth wheels with “model overviews” and printable PDF brochures for Pilgrim 1500 Series, Pilgrim 2500 Series, Open Road, Legends MP, Legends HP, Cirrus Ultra Lite and Cirrus Hybrid product lines. One of the most exciting new features on Pilgrim’s new website is the interactive Décor section. A view of the inside of the trailer is displayed with clickable buttons that transform the view of the trailer with different fabric, décor and wood options. Each trailer or fifth wheel comes with different décor patterns--a variety of colors for the sofa, chair, dinette and bedspread along with wood tones to compliment any taste. Detailed lists of standard equipment included are also available, organized into sections for Exterior, Interior, Kitchen, Bedroom, Bathroom, Utilities and Construction. Optional equipment is also listed. 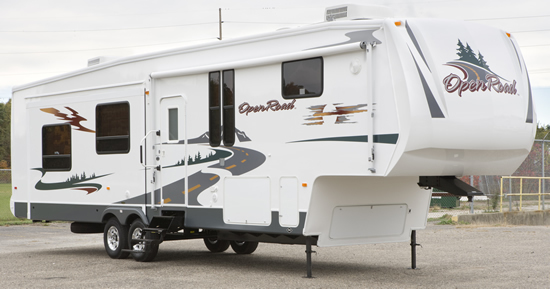 A gallery of photos of each model is available in order to see each trailer or fifth wheel from every angle. The new website, www.pilgrimintl.com, showcases Pilgrim products with clickable links to galleries for viewing. A welcome page spotlights Pilgrim’s “Latest Product Features” and “Events and News” to keep visitors up to date about new products, features or company news. A “Find a Dealer” link makes that process as easy as typing in a zip code. A dealer “login” link allows dealers access to special programs offered by Pilgrim International. A link to the “Pilgrim Camper Club” provides contacts and information on the next rally. The new website also contains many extra helpful features for customers. A toolbar at the bottom of the website has an “email a friend” option which allows the viewer to bookmark and send entire pages of the website to a friend or relative. It also has a “print layout” button, which converts the currently active page into a printer-friendly version. Pilgrim International, Inc. is the leading innovator in travel trailer and fifth-wheel products. Celebrating its sixth year in business in 2008, Pilgrim has quickly grown to the 15th largest producer in the towable segment of the $14 billion RV market. Pilgrim International is a recognized leader for product innovation, quality and value in travel trailers and fifth wheels.